The current global commodity price shocks have generally affected many commodity dependent countries and also raised serious questions on the viability of regional blocks whose member countries are predominantly commodity-based economies. 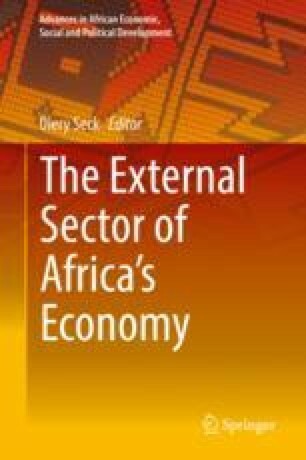 ECOWAS sub-region typifies evidence of primary export as the main source of foreign exchange to member countries, thereby making them susceptible to commodity price shocks. This paper examines the effect of commodity price shocks on ECOWAS member countries using a panel data of 13 member countries for the period 2000–2015. Dynamic General Method of Moment (GMM) technique was adopted using an instrumental variable (IV) regression model. The results showed that precious metals were positively but insignificantly related to gross domestic product per capita which the study adopted as a measure of macroeconomic indicator. Also, there was a positive and statistically significant relationship between energy prices and the dependent variable. However, a negative relationship was observed between non-energy prices and gross domestic product per capita. In addition, the results showed that 87% of the economy is susceptible to energy price shocks. This result forces a rethink of the integration agenda not only along monetary lines, but also along diversification integration. The views expressed in this paper are those of the authors and do not represent the official position of the Central Bank of Nigeria or its Board of Directors. UNCTADSTAT. (2016). United Nations trade and development statistics for 2016. Available http://unctadstat.unctad.org/EN/Infographics.html#&gid=2018&pid=Total%20merchandise%20trade%2C%202017%20(Final%20figures).